Organizers play important roles during the embryonic development of many animals. The most famous example is the Spemann organizer that sets up embryonic axes in amphibian embryos. In spiders, a group of BMP secreting mesenchymal cells (the cumulus) functions as an organizer of the dorsoventral axis. Similar to experiments performed with the Spemann organizer, transplantation of the cumulus is able to induce a secondary axis in spiders. Despite the importance of this structure, it is unknown which factors are needed to activate cumulus specific gene expression. To address this question, we performed a transcriptomic analysis of early embryonic development in the spider Parasteatoda tepidariorum. Through this work, we found that the transcription factor Pt-Ets4 is needed for cumulus integrity, dorsoventral patterning and for the activation of Pt-hunchback and Pt-twist expression. Furthermore, ectopic expression of Pt-Ets4 is sufficient to induce cell delamination and migration by inducing a mesoderm-like cell fate. At the earliest stages of animal development, embryos consisting of only a handful of cells must figure out where each part of their body will come from. The first step in this process is to determine what will be their head versus their tail, and what will be their front versus their back. Many animals use specialized groups of cells, called “organizers”, to make this decision. This occurs in backboned animals – including humans – and also in distantly related animals such as spiders. In spiders, the developing embryo must form an organizer called the “cumulus” or the spiderling will not develop correctly. In order to form and maintain the cumulus, various genes must be turned on in a carefully controlled order in exactly the right cells. Pechmann et al. have now discovered the role of a previously unknown gene (called Pt-Ets4) that marks the spot where the cumulus forms. This gene is required for cumulus maintenance and it also helps to activate a number of other cumulus-specific genes. When this gene is disrupted, the spider embryo does not properly differentiate its front from its back. The findings presented by Pechmann et al. add to a growing foundation of studies aiming to understand how genes ‘talk’ to one another and organize embryos as they develop. In years to come, the unraveling of these gene pathways, where genes sequentially turn other genes on and off, will allow us to more fully understand how a single cell can grow into a complete adult animal. The self-regulatory capacities of vertebrate embryos were most famously demonstrated by Spemann and Mangold. They found that by grafting the dorsal-lip of an amphibian embryo (now known as the Spemann Organizer) to the ventral side of the host gastrula embryo it was possible to induce a secondary body axis (Spemann and Mangold, 2001; De Robertis, 2009; Anderson and Stern, 2016). Intriguingly, spider embryos also have high self-regulatory capacities, even to the extent that twinning can occur spontaneously (Napiórkowska et al., 2016; Oda and Akiyama-Oda, 2008). During spider embryogenesis a group of migratory cells (the cumulus) is needed to break the radial symmetry of the early embryo and to induce the dorsoventral body axis (Oda and Akiyama-Oda, 2008; Akiyama-Oda and Oda, 2003, 2006; McGregor et al., 2008; Hilbrant et al., 2012; Mittmann and Wolff, 2012; Schwager et al., 2015). Similar to the vertebrate experiments, Holm showed that transplanting cumulus material was able to induce a secondary axis in spider embryos (Holm, 1952). Modern work has shown that the cumulus signals via BMP signaling (again, similar to vertebrates). The mesenchymal cumulus cells are the source of the BMP receptor ligand Decapentaplegic (Akiyama-Oda and Oda, 2006). Interfering with the BMP signaling pathway by gene knockdown results in the loss of dorsal tissue identity, which in turn leads to completely radially-symmetric and ventralized embryos (Akiyama-Oda and Oda, 2006). The cumulus forms in the center of the so-called germ-disc (the embryonic pole of the embryo) and migrates underneath the ectoderm towards the rim of the disc. Arrival of the cumulus at the rim induces the opening of the germ-disc (Oda and Akiyama-Oda, 2008; Akiyama-Oda and Oda, 2003, 2006; McGregor et al., 2008; Hilbrant et al., 2012; Mittmann and Wolff, 2012; Schwager et al., 2015). Cumulus migration is dependent on the Hh-signaling pathway (Akiyama-Oda and Oda, 2010) and it was shown that the knockdown of components of this signaling pathway results in cumulus migration defects and in the ectopic opening of the germ-disc (Akiyama-Oda and Oda, 2010). How the cumulus is specified and forms is still under debate. During the formation of the germ-disc a small cluster of cells ingress and form an indentation where the future center of the fully formed germ-disc will be located. This cluster of cells appears as a visible spot and is called the primary thickening (Akiyama-Oda and Oda, 2003; Hilbrant et al., 2012). However, it is not clear whether all or only a subset of the cells of the primary thickening give rise to the cumulus, or if cumulus cells arise from subsequent cell invagination at the site of the primary thickening (Oda and Akiyama-Oda, 2008; Akiyama-Oda and Oda, 2003). Cell tracing (Holm, 1952; Edgar et al., 2015), as well as the expression of the endodermal marker forkhead (Oda et al., 2007) within the primary thickening/cumulus cells led to the suggestion that the primary thickening/cumulus cells are central endodermal cells (Hilbrant et al., 2012; Oda et al., 2007). However, these studies could not completely rule out that the labeled cumulus cells develop into cells of the visceral mesoderm (Edgar et al., 2015). During the last 15 years, research focused on candidate genes known to be involved in development in Drosophila melanogaster has revealed several aspects of how spider embryos pattern their main body axis. However, there are many open questions regarding the early regulation of cumulus specific gene expression, cumulus establishment and maintenance. To overcome the limitations of the candidate gene approach, we have carried out transcriptome sequencing of carefully staged embryos to find new genes involved in cumulus and axial patterning in the spider Parasteatoda tepidariorum. From this work, we have identified the transcription factor Pt-Ets4 as a new gene expressed during early development and have found it to be expressed exclusively within the central primary thickening and the cells of the migrating cumulus. Our combined genetic and cellular analyses show that Pt-Ets4 is needed for the integrity of the cumulus. We found that the knockdown of this gene leads to embryos that show axis patterning defects reminiscent of BMP knockdown phenotypes, suggesting that an intact cumulus is needed to induce the formation of the bilaterally symmetric spider embryo. Importantly, Pt-Ets4 is necessary and sufficient for driving the early expression of twist (a gene involved in gastrulation and mesoderm formation in Drosophila) and hunchback, and the ectopic expression of Pt-Ets4 is sufficient to induce cell delamination. The formation of the germ-disc is one of the most important events during spider embryogenesis. While a regular blastoderm (with no visible axial polarity) is present at stage 2, the germ-disc condenses during stage 3 of embryonic development (Figure 1A and B, for detailed description see [Pechmann, 2016]). This event leads to the establishment of the anterior/posterior body axis (anterior: rim of the disc; posterior: center of the disc). Early embryonic expression of Pt-Ets4. (A and B) Pt-Ets4 is expressed within the cluster of cells (arrow in A) that will develop into the central primary thickening (pt) (B). (C–D’) Confocal scans (single optical slices (C and D’); maximum intensity projection (D)) of embryos stained for Pt-Ets4 (FastRed stain; red) and nuclei (DAPI; blue). Pt-Ets4 is expressed within the primary thickening and in the migrating cumulus (cu), which are covered by the surface epithelium of the germ-disc. Orthogonal views are boxed in green and magenta. The same embryo is depicted in D and D’. Scale bar is 100 µm. To find new genes that are involved in the process of axis specification we sequenced the embryonic transcriptomes of stage 1, stage 2 and stage 3 embryos (Figure 1—figure supplement 1) and searched for genes showing a similar expression profile as Pt-decapentaplegic (Pt-dpp), Pt-hedgehog (Pt-hh) and Pt-patched (Pt-ptc) (representing genes that show early transcription and are required for axis formation or cumulus migration, respectively (Akiyama-Oda and Oda, 2006, Akiyama-Oda and Oda, 2010); Figure 1—figure supplement 1). One of the candidates was an Ets-like gene with high similarity to Drosophila melanogaster Ets4/Ets98B (see Figure 1—figure supplement 2), henceforth called Parasteatoda tepidariorum Ets4 (Pt-Ets4). Prior to germ-disc condensation, Pt-Ets4 is expressed within the cluster of cells that will form the center of the future germ-disc at early stage 3 (Figure 1A). Expression persists throughout germ-disc formation and, at stage 4, Pt-Ets4 is strongly and exclusively expressed within the central cluster of cells (the so-called primary thickening, Figure 1B) that has delaminated during germ-disc formation (Figure 1C). During stage 5, the cumulus starts to migrate from the center of the germ-disc to its periphery (Oda and Akiyama-Oda, 2008; Akiyama-Oda and Oda, 2003, 2006; McGregor et al., 2008; Hilbrant et al., 2012; Mittmann and Wolff, 2012; Schwager et al., 2015). At this stage Pt-Ets4 is strongly and exclusively expressed in the migrating cumulus cells (Figure 1D and D’). We were not able to detect Pt-Ets4 transcripts in ovaries and early stage 1 embryos via RNA in situ hybridization (Figure 1—figure supplement 3A and B). In addition, our sequencing data shows that Pt-Ets4 is only expressed at a very low level during early stage 1, but is mildly up-regulated at late stage 2 and strongly up-regulated at early stage 3 (Figure 1—figure supplement 1). From this we conclude that Pt-Ets4 transcripts are not maternally provided. Time-lapse imaging and cross-sectioning revealed that the knockdown of Pt-Ets4 neither affected formation of the germ-disc nor of the primary thickening/cumulus (Video 1B; middle column in Figure 2, Figure 3A and B). However, during stage 5, cumulus integrity was affected in Pt-Ets4 knockdown embryos (Video 1B, middle column in Figure 2). While in control embryos the cumulus migrated towards the rim (Video 1A, left column in Figure 2), the cumulus of Pt-Ets4 RNAi embryos remained at the center of the germ-disc until early stage 5 and disappeared soon after gastrulation was initiated at the center and at the rim of the disc (Video 1B (15h onwards), middle column in Figure 2). Analysis of mid-stage 5 Pt-Ets4 RNAi embryos for the expression of the cumulus marker Pt-fascin (Akiyama-Oda and Oda, 2010) revealed that although the cells of the cumulus were still in the center of the germ-disc, they appeared to be more loosely organized (Figure 3C and D). Pt-Ets4 is required for cumulus integrity. Stills from the embryos shown in Video 1. The cumulus (asterisk) migrates in the control, disappears in the Pt-Ets4 RNAi and stays in the center of the germ-disc in Pt-ptc RNAi embryo. Ectopic, central opening (induction of the dorsal field) of the germ-disc is depicted via the dotted line (Pt-ptc RNAi st. 6). Posterior (P) and anterior (A) tube formation in Pt-Ets4 and Pt-ptc knockdown embryos is also indicated. Cumulus integrity and signaling is affected in Pt-Ets4 knockdown embryos. (A and B) Cross-section through the central cumulus of ubiquitously stained (via Pt-arm RNA in situ hybridization) control (A) and Pt-Ets4 RNAi (B) embryos. (C and D) control and Pt-Ets4 RNAi embryos stained for the cumulus marker Pt-fascin. Cells of the cumulus are dispersing in the Pt-Ets4 knockdown embryo (D). (E and F) Single color double stain of anterior Pt-otd expression (anterior ring) and nuclear localized pMAD in the cells overlaying the cumulus. pMAD signal is absent in Pt-Ets4 RNAi embryos (F). In situ hybridization for the ventral fate marker Pt-sog (G, G’, J and J’) or the segmental marker Pt-en (H, I, K and L) in control (G–I) and Pt-Ets4 knockdown embryos (J–L). The same embryos in fluorescence vs. bright field channel are shown in G and G’ as well as in J and J’. Nuclear stain (DAPI)/bright field overlay is shown in A-F, H, I, K and L. Flat mounted embryos in C-F. Lateral-ventral view (G, G’, J–K), lateral view (H), ventral view (I). Abbreviations: ch: cheliceral segment; L1-L4: walking leg bearing segments 1–4; O1: opisthosomal segment 1. Knockdown of Pt-Ets4 and Pt-ptc. Live imaging of a control (A), a Pt-Ets4 RNAi (B) and a Pt-ptc RNAi (C) embryo under transmitted light conditions. The video starts at stage 3 and ends at stage 9 of embryonic development. Cumulus migration and normal germ-band formation is visible in the control embryo (A). The cells of the cumulus disperse in the Pt-Ets4 knockdown embryo (B). The ventralized Pt-Ets4 RNAi embryo stays radially symmetric and posterior tube formation is initiated (30 hr onwards). The cumulus of the Pt-ptc RNAi embryo does not migrate (C). The germ-disc opens up at the central position and the radially symmetric embryo overgrows the yolk and anterior tube formation is initiated (48 hr onwards). 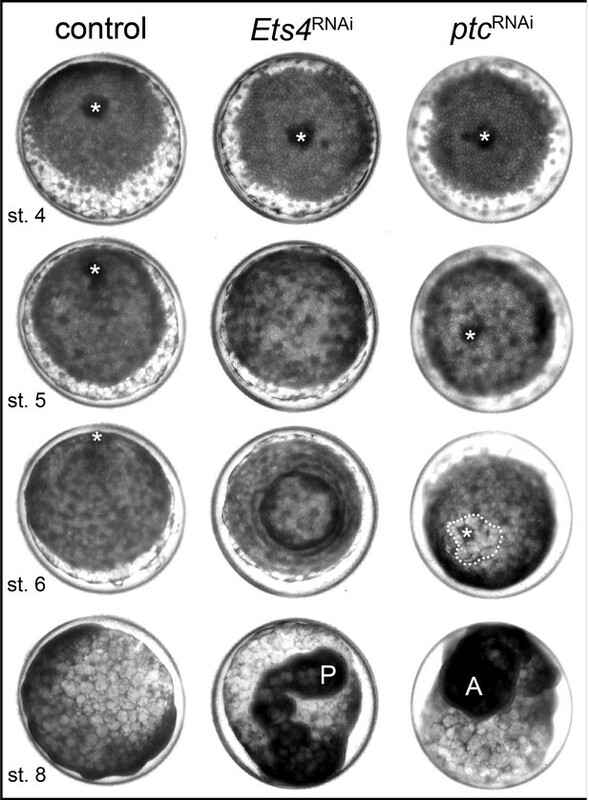 In Pt-Ets4 knockdown embryos the radial symmetry of the germ-disc was not broken (as shown by the formation of a tube-like germ band in Video 1B (30h onwards), and the middle column in Figure 2), presumably due to the loss of the cumulus. To investigate this phenotype in more detail, we knocked down another gene that also results in defects in radial symmetry breaking, Pt-ptc. In Pt-ptc knockdown embryos, cumulus migration is lost but the cumulus itself is otherwise unaffected (Akiyama-Oda and Oda, 2010). After pRNAi with Pt-ptc, the cumulus stays in the center of the germ-disc (Video 1C; right column in Figure 2) and BMP signaling is ectopically activated (as shown via antibody staining against the phosphorylated form of mothers against dpp (pMAD) (Akiyama-Oda and Oda, 2010)). As a result, the germ-disc ectopically opened at the center and the dorsal field was induced at the posterior pole of the Pt-ptc RNAi embryos (right column in Figure 2). This ectopic induction of the dorsal field in the center of the germ-disc was never observed in the Pt-Ets4 RNAi embryos. To test if the disappearing cumulus was at least partially able to activate BMP signaling in the germ-disc of Pt-Ets4 RNAi embryos, we performed a pMAD antibody staining in both control and Pt-Ets4 RNAi embryos. In control embryos the cumulus reached the periphery of the germ-disc at late stage 5 and a strong pMAD staining was visible in the overlying ectodermal cells (Figure 3E, Figure 3—figure supplement 1). At this stage, the anterior marker Pt-orthodenticle (Pt-otd) was expressed in a ring, which had a width of 3–5 cells (Akiyama-Oda and Oda, 2003; Pechmann et al., 2009; Akiyama-Oda and Oda, 2016) (Figure 3E). In Pt-Ets4 knockdown embryos Pt-otd expression was unaffected but nuclear pMAD was not detectable (Figure 3F). This lack of BMP signaling explains why Pt-Ets4 RNAi embryos do not induce the dorsal field and stay radially symmetric. Indeed, the knockdown embryos were completely ventralized; the expression of the ventral marker Pt-short-gastrulation (Pt-sog) was uniform around the embryonic circumference and the segmental marker Pt-engrailed (Pt-en) was expressed in symmetric rings demonstrating the radial symmetry of the embryo (Figure 3G–L). 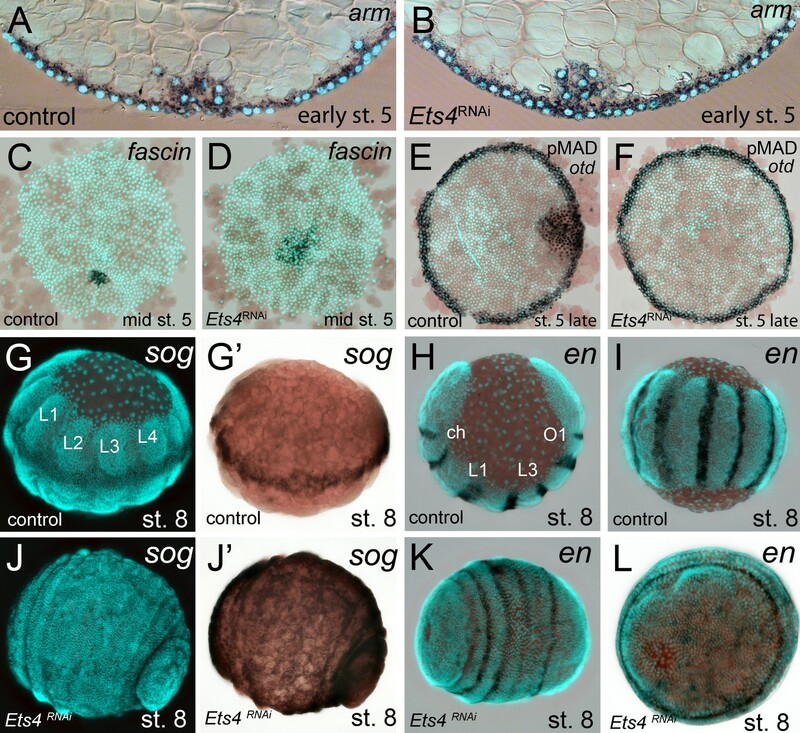 During later development the embryonic tissue either grew completely over the yolk (Figure 3J–L), or a tube like structure elongated at the posterior of the embryo (Video 1B, middle column Figure 2). This was in contrast to Pt-ptc RNAi embryos, where the germ-disc opened up centrally and a tube like structure formed at the anterior of the embryo (right column Figure 2; Video 1C). The Pt-Ets4 knockdown phenotype is rather similar to that of Pt-dpp, although cumulus migration/integrity is not affected in Pt-dpp RNAi embryos (Akiyama-Oda and Oda, 2006). This observation, plus the early and strong expression of Pt-Ets4 and the fact that BMP signaling disappeared upon Pt-Ets4 knockdown, led us to hypothesize that Pt-Ets4 functions as an activator of Pt-dpp transcription within the cells of the cumulus. However, there was no obvious difference in the expression of Pt-dpp in stage 4 control and Pt-Ets4 RNAi embryos (Figure 4A and E). Vice versa, Pt-dpp appears not to be regulating the expression of Pt-Ets4 (Figure 4—figure supplement 1A). In addition, Hh signaling seems not to be involved in the regulation of Pt-Ets4 expression and Pt-Ets4 appears not to regulate the expression of Pt-ptc within the primary thickening (Figure 4—figure supplement 1B and C). Analysis of ‘cumulus marker’ genes. Flat mount preparation of in situ stained stage 4 embryos. While Pt-dpp and Pt-fkh expression is unaffected (compare A to E and B to F), Pt-fascin expression is slightly (compare C to G) and Pt-hb expression is strongly down regulated in Pt-Ets4 RNAi embryos (compare D to H). In order to determine what other genes Pt-Ets4 may regulate, we studied the expression of genes normally expressed in the primary thickening in Pt-Ets4 RNAi embryos. We found that Pt-forkhead (Pt-fkh) expression was unaffected (Figure 4B and F), while the cumulus marker Pt-fascin was slightly down regulated, and Pt-hunchback (Pt-hb) was strongly down regulated in Pt-Ets4 knockdown embryos (Figure 4C,D,G and H). As Pt-Ets4 is strongly expressed in the cumulus and is required for cumulus integrity, we wondered how ectopic expression of Pt-Ets4 would affect cell behavior. To generate small cell clones ectopically expressing Pt-Ets4 within the germ-disc, we micro-injected late stage 1 embryos (via single cell/blastomere injections [Hilbrant et al., 2012; Kanayama et al., 2010]) with in vitro synthesized capped mRNA coding for an EGFP-Pt-Ets4 fusion protein (see Figure 5—figure supplement 1). Our first observation was that the EGFP-Pt-Ets4 fusion protein localizes to the nuclei of the injected cells, suggesting that the nuclear-localization-signal of Pt-Ets4 is functioning normally (Figure 5A). EGFP-Pt-Ets4 marked cell clones resembled wild-type until stage 4. As soon as a dense germ-disc formed, however, the cell clones expressing EGFP-Pt-Ets4 seemed to move beneath the germ-disc and the EGFP signal became occluded by the opaque cells of the germ-disc (Figure 5B). We have never seen such behavior following injection of EGFP-NLS constructs alone (Figure 5F–F’’’), indicating that the change in cell behavior is due to the ectopic expression of Pt-Ets4. Ectopic expression of Pt-Ets4 causes the delamination and migration of cells. (A and A’) A stage 4 embryo in which a cell clone has been marked via the ectopic expression of an EGFP-Pt-Ets4 fusion construct. The fusion protein localizes to the nuclei. (B and B’) The cell clone has delaminated four hours later. As the overlaying epithelium is highly light-scattering, the nuclear EGFP signal is no longer visible. The inset shows the magnification of the boxed region in A and B. (C and D) Stills from Video 2A and D (magnifications of the lynGFP positive regions). Cells expressing lynGFP alone (C–C’’) stay at the surface epithelium of the germ-disc. Cells expressing lynGFP/EGFP-Pt-Ets4 (D–D’’) constrict and delaminate. (E) EGFP antibody staining (maximum intensity projection is shown in E and the orthogonal view is shown in E’) of a fixed embryo ectopically expressing EGFP-Pt-Ets4. (F–F’’’) Stills from Video 3A (control). A cell clone marked via the ectopic expression of nuclear localized EGFP (EGFP-NLS) marks the ectoderm during germ-band formation. (G–G’’’) Stills from Video 3B (ectopic expression of Pt-Ets4). A cell clone ectopically expressing EGFP-Pt-Ets4 in combination with EGFP-NLS delaminates after germ-disc formation (G’). The cells of this cell clone start to disperse during later stages of development (G’’ and G’’’). Scale bar is 100 µm in E.
To further visualize the process of cell clone delamination, we marked cell membranes by co-injecting capped mRNA coding for EGFP-Pt-Ets4 together with capped mRNA coding for lynGFP (Köster and Fraser, 2001). In control embryos (ectopic expression of lynGFP alone), lynGFP strongly marked the cell outlines and cell clones stayed at the surface epithelium of the germ-disc (Video 2A, Figure 5C–C’’). Regardless of the position and the shape of the cell clone, cells expressing lynGFP/EGFP-Pt-Ets4 constricted and delaminated shortly after the formation of the germ-disc (Video 2B–D, Figure 5D–D’’). The detection of EGFP-Pt-Ets4 cell clones in fixed embryos using an antibody against EGFP confirmed that the labeled cells were below the epithelium of the germ-disc (Figure 5E and E’). Ectopic expression of Pt-Ets4 causes the delamination of cells. Ectopic expression of lynGFP (A) and lynGFP in combination with EGFP-Ets4 (B-D). 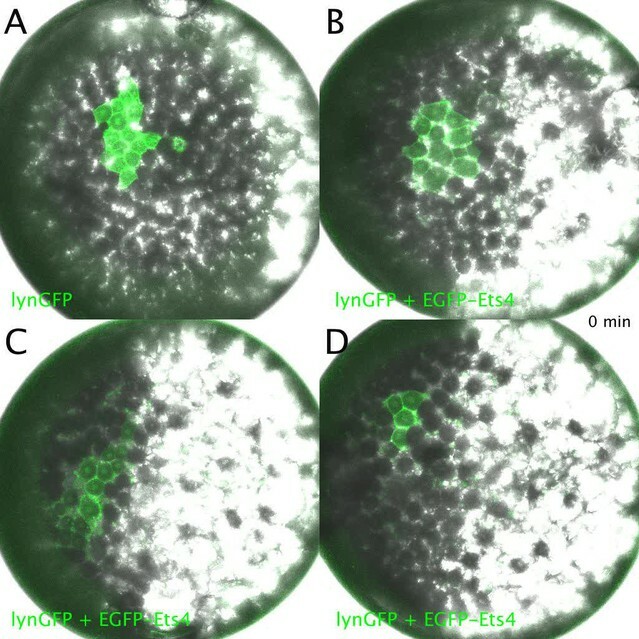 The lynGFP positive cell clone (A) stays in the ectodermal cell layer of the germ-disc. Regardless of the shape of the cell clones, Pt-Ets4 positive cells apically constrict and delaminate (B-D). The nuclear signal of the EGFP-Pt-Ets4 fusion construct (and the membrane signal of the lynGFP) is hardly visible after the delamination process. Therefore, we co-injected capped mRNA for EGFP-Pt-Ets4 with capped mRNA for nuclear localized EGFP (EGFP-NLS, see Figure 5—figure supplement 1), a construct that we have found to produce a very bright and persistent fluorescent signal. This experiment resulted in a strong nuclear localized EGFP signal within the marked cell clone, which we used to perform time-lapse imaging. 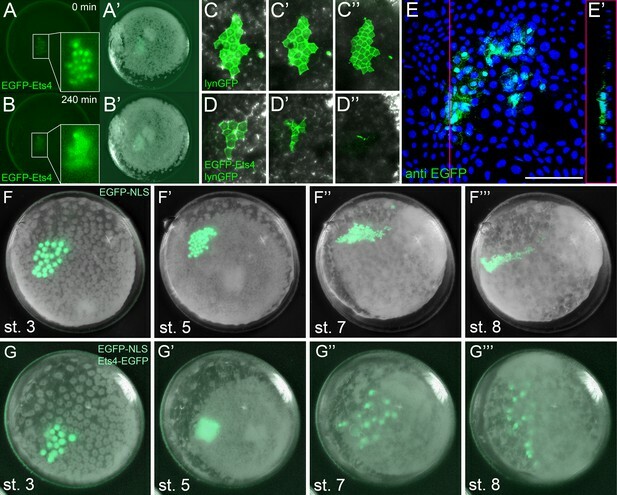 While in the control embryos (injected with EGFP-NLS alone) the marked cell clones persisted at the surface of the germ-disc (Video 3A, Figure 5F and F’), the cell clone expressing both EGFP-NLS and EGFP-Pt-Ets4 delaminated shortly after the formation of the germ-disc (Video 3B, Figure 5G and G’). As previously shown (Kanayama et al., 2010, Kanayama et al., 2011), germ-disc cells continue to divide and undergo convergent extension during the formation of the germ-band, which causes cell clones to become thin and elongated as seen in our control EGFP-NLS clones (Video 3A, Figure 5F’’ and F’’’). In contrast to this, cell clones expressing both EGFP-NLS and EGFP-Pt-Ets4 stopped dividing as soon they delaminated. In addition, when the cumulus started to migrate, the delaminated cells of the EGFP-NLS/EGFP-Pt-Ets4 marked cell clone lost contact with each other and spread out underneath the germ-disc/germ-band epithelium (Video 3B, Figure 5G’’ and G’’’). This observation was consistent and reproducible in multiple analyzed embryos (Video 4). Ectopic expression of EGFP-NLS (A) and EGFP-NLS in combination with EGFP-Ets4 (B). The cell clone positive for EGFP-NLS (A) stays in the ectodermal cell layer of the germ-disc. Cells further divide and form a long and thin cell clone (via convergent extension [Kanayama et al., 2011]) at stage 8 of embryonic development. The Pt-Ets4 positive cell clone delaminates at stage 4 (B). Cells stop dividing and start to disperse as soon as the cells of the cumulus start to migrate (st. 5). Ectopic expression of EGFP-NLS and EGFP-Pt-Ets4 in multiple embryos. Ectopic expression of EGFP-NLS (A-D) and EGFP-NLS in combination with EGFP-Ets4 (E-H). EGFP-NLS (A-D) and ectopic clones expressing Pt-Ets4 (E-H) have equal positions within the germ-disc. While all of the control cell clones (A-D) form long and thin stretched cell clones at stage 8 of embryonic development, the Pt-Ets4 positive cells clones (E-H) delaminate and the cells disperse from stage 5 onwards. Only the EGFP channel is shown for all embryos. These results demonstrate that Ets4 expression is sufficient to induce cell delamination and migration in embryos of P. tepidariorum. As already mentioned, Pt-Ets4 seems to have no influence on the early expression of Pt-dpp itself (Figure 4A and E). Furthermore, we were not able to detect Pt-dpp transcripts in cells ectopically expressing Pt-Ets4 (Figure 6A and A’). In contrast to Pt-dpp, we did find that Pt-Ets4 is regulating the expression of Pt-hb. While Pt-hb expression was nearly absent in Pt-Ets4 RNAi embryos (Figure 4H), Pt-hb transcripts were present in the ectopically Pt-Ets4 positive cell clone (Figure 6B and B’). Pt-Ets4 regulates Pt-hb and Pt-twi expression within the primary thickening. Live stage 4 embryos in which a cell clone is marked via the ectopic-expression of EGFP-Ets4 are depicted in A-C. The same embryos have been fixed and analyzed for their expression of Pt-dpp (A’), Pt-hb (B’) and Pt-twi (C’), respectively. Expression of Pt-twi in a control (D) and a Pt-Ets4 knockdown embryo (E). A’, B’, C’, D and E are false-color overlays of in situ hybridization images. The behavior of the Pt-Ets4 positive cells is reminiscent of migrating gastrulating cells that invade the germ-disc from the center and from the rim of the germ-disc (Mittmann and Wolff, 2012; Kanayama et al., 2011; Yamazaki et al., 2005) (see Video 1A). As Pt-Ets4 activates the expression of Pt-hb (a gene that is known to be expressed in mesodermal cells in diverse animals [Schwager et al., 2009; Franke and Mayer, 2015; Kerner et al., 2006]) we wondered if Pt-Ets4 misexpression is inducing a mesoderm-like cell fate. For this reason, we tested whether the ectopic expression of Pt-Ets4 is also inducing the expression of the key mesodermal marker Pt-twist (Pt-twi). Indeed, Pt-twi was detectable within the cell clone that ectopically expressed Pt-Ets4 (Figure 6C and C’, compare to controls in Figure 6—figure supplement 1). Interestingly, in the stage 4 embryos ectopically expressing Pt-Ets4, we could not only detect Pt-twi transcripts within the ectopic Pt-Ets4 expressing cell clone, but also within the central primary thickening (Figure 6C’). This comes as a surprise, as it was reported that Pt-twi expression is not initiated before the end of stage 5 (Yamazaki et al., 2005). For this reason, we reanalyzed the full expression series of Pt-twi in wild-type embryos and we were able to confirm that Pt-twi is expressed in the developing primary thickening of stage 3 and 4 embryos (Figure 6—figure supplement 2A–C). Finally, we confirmed the regulation of Pt-twi via Pt-Ets4 by analyzing the expression of Pt-twi in Pt-Ets4 knockdown embryos. Pt-twi transcripts were no longer detectable in the primary thickening of stage 4 Pt-Ets4 RNAi embryos (Figure 6D and E). However, late segmental mesoderm specification was unaffected, as the expression of Pt-twi was unchanged in stage 7 Pt-Ets4 knockdown embryos (Figure 6—figure supplement 2H–I’). This confirms that the formation and migration of the cumulus and later gastrulation events from central and peripheral parts of the germ-disc are two independent processes (Hilbrant et al., 2012; Oda et al., 2007). Overall, we suggest that the activation of Pt-twi and Pt-hb by Pt-Ets4 in cell clones initiated a mesoderm-like cell fate that led to the migratory behavior of the ectopic Pt-Ets4 positive cells. Ets proteins belong to a highly conserved family of transcription factors (Laudet et al., 1999) that play roles in a variety of different cellular processes (e.g. growth, migration, differentiation) and it has been shown that these factors can act as activators or repressors of transcription (Oikawa and Yamada, 2003; Sharrocks et al., 1997; Sharrocks, 2001; Hollenhorst et al., 2011). In D. melanogaster, Ets4 (also known as Ets98B) is expressed in the oocyte nucleus and the primordial germ cells (PGC) (Chen et al., 1992; Hsouna et al., 2004) and there is evidence that Dm-Ets4 is involved in the migration of the PGCs (Hsouna et al., 2003). Furthermore, the mammalian homolog of Ets4, Pdef, is down regulated in invasive and migratory breast tumor cells (Feldman et al., 2003). Together, these reports suggest that Ets4 regulates migratory cell behavior in different organisms. Here we show that in the spider P. tepidariorum, Ets4 is strongly expressed in the migrating cumulus and that Pt-Ets4 is needed for the integrity of the cumulus, a group of cells, which need to migrate together in order to function normally. We also show that the ectopic expression of Pt-Ets4 is able to induce cell delamination and cell migration within the ectodermal germ-disc cells (a process that is known as epithelial-to-mesenchymal transition [Thiery et al., 2009; Gilmour et al., 2017]). Taken together, these findings suggest that Pt-Ets4 likely plays an important role in the migratory behavior of the cumulus. It has been suggested that the cumulus cells of many higher spiders are specified during early embryogenesis and are not secondarily induced after the formation of the germ-disc (Edgar et al., 2015). Pt-Ets4 marks the cells of the developing primary thickening (st. 3 and 4) and of the migrating cumulus. Therefore, our results indicate that in P. tepidariorum as well, cumulus cells are induced before germ-disc formation is complete. As the primary thickening forms in the absence of Pt-Ets4, Pt-Ets4 cannot be the only factor that is required for the specification of the cells that will develop into the primary thickening (and later into the cumulus). This is supported by our finding that Pt-Ets4 is sufficient to induce the delamination and migration of ectodermal cells, but it is not sufficient to induce the formation of a fully functional ectopic cumulus. So far, there have been no reports of any gene knockdown that completely inhibits the formation of the primary thickening. The cumulus is characterized by the co-expression of multiple genes, including Pt-dpp. As shown by our analyses, Pt-Ets4 seems not to be involved in the regulation of Pt-dpp itself, as well as several other cumulus marker genes. Therefore, important factors of the cumulus are missing in the ectopic Pt-Ets4 expression cells. Taken together, our findings indicate that the formation of the primary thickening is a process that is buffered via the input of several genes or other unknown mechanisms/factors. Our results also show that an intact cumulus is needed to open up the germ-disc and to initiate the formation of a bilaterally symmetric spider embryo. In the germ-disc of P. tepidariorum embryos, BMP signaling is active from early stage 5 (Figure 3—figure supplement 1). However, the germ-disc does not open up before the arrival of the cumulus at the rim of the disc at the end of stage 5 even though the putative receptors are ubiquitously expressed. Therefore, the establishment of the dorsal field is a precisely timed process, and it is possible that in Pt-Ets4 knockdown embryos the cells of the cumulus disperse too early, and are no longer able to induce the opening of the germ-disc at the end of stage 5. An alternative, although not mutually exclusive, explanation involves the fact that the cumulus may signal via cytonemes (Akiyama-Oda and Oda, 2003; Hilbrant et al., 2012). These structures could be affected in Pt-Ets4 RNAi embryos, as the cumulus cells lose contact with each other. Lastly, Pt-Ets4 could be involved in regulating the BMP pathway activity at a different level (e.g. protein-protein interactions, protein modifications) or the knockdown of Pt-Ets4 could result in a fate change of the cumulus cells before cumulus migration is initiated. Investigation of each of these hypotheses will require the establishment of advanced techniques to study cell migration, cell microstructure, and protein interactions in P. tepidariorum. Via both our loss- and gain-of-function experiments, we found that Pt-Ets4 is involved in the activation of at least two genes that are expressed within the primary thickening of stage 4 embryos. These genes are Pt-hb and Pt-twi. For Pt-hb, it was already shown that this gene is strongly expressed within the primary thickening of stage 4 embryos (Schwager et al., 2009). However, it was reported that Pt-twi expression is not detectable before late stage 5 (Yamazaki et al., 2005), while we found that Pt-twi is expressed in the primary thickening already at stage 3 and 4. This is in agreement with our sequencing data, which shows that Pt-twi is strongly up regulated from stage 2 to stage 3 (Figure 1—figure supplement 1). This result indicates that the cumulus cells are not endodermal in nature (Oda and Akiyama-Oda, 2008; Hilbrant et al., 2012; Oda et al., 2007) but rather are mesendodermal. For this reason, the genetic composition and the eventual fate of the cumulus should be closely examined in future studies. The cumulus is a fascinating example of a migrating and signaling organizer. Thus far, cumulus-related dorsoventral patterning defects have been observed in spider embryos that either completely lack BMP signaling or are deficient for cumulus migration (Akiyama-Oda and Oda, 2006, Akiyama-Oda and Oda, 2010). Here, we show that the knockdown of the transcription factor Pt-Ets4 generates a novel dorsoventral phenotype that is dependent on cumulus integrity. Our results show that formation of the bilaterally symmetric spider embryo is a precisely timed process that relies on the presence of an intact, migrating and signaling cumulus. Parasteatoda tepidariorum adults and embryos were obtained from our laboratory culture at the University of Cologne. Spiders were kept in plastic vials at room temperature and fed with Drosophila melanogaster and crickets (Acheta domesticus and Gryllus bimaculatus). Embryos were staged according to (Mittmann and Wolff, 2012). PCR amplification and cloning of Pt-Ets4 was performed using standard techniques. Pt-twist (AB167807.1), Pt-hunchback (FM956092.1), Pt-engrailed (AB125741.1), Pt-fork-head (AB096073.1), Pt-armadillo (AB120624.1), Pt-orthodenticle (AB096074.1), Pt-short-gastrulation (AB236147.1), Pt-decapentaplegic (AB096072.1) and Pt-fascin (AB433905.1) have been isolated previously. The transcriptomes of the embryonic stages 1–3 (early stage 1, late stage 2 and early stage 3; see Figure 1—figure supplement 1) were sequenced (HiSeq2000) at the Cologne Center for Genomics. The total RNA of three cocoons per stage was pooled and sequenced in each case. The sequence reads (deposited to the Sequence Read Archive (http://www.ncbi.nlm.nih.gov/sra/ (RRID:SCR_004891), BioProject ID: PRJNA383558) were mapped to the AUGUSTUS gene predictions (RRID:SCR_008417) (https://i5k.nal.usda.gov/Parasteatoda_tepidariorum, Schwager et al., 2017) using Bowtie 2 (Langmead and Salzberg, 2012). New candidates were picked according to their expression profile. These new candidates (including Pt-Ets4; AUGUSTUS prediction: aug3.g4238) were up-regulated in a similar manner as Pt-decapentaplegic, Pt-hedgehog and Pt-patched (genes that show a defect in dorsoventral patterning or cumulus migration upon knockdown (Akiyama-Oda and Oda, 2006, Akiyama-Oda and Oda, 2010) (see Figure 1—figure supplement 1). A 1094 bp fragment of Pt-Ets4 was amplified using the primer Pt-g4238-Fw (5’-GTA CAC AGC ACC TTC TAT TAT GG-3’) and Pt-g4238-Rev (5’-CCT TCT TGT AAT ATT GGC GA-3’) in an initial PCR. For the production of dsRNA a T7 promoter sequence was added to the 5’ and 3’ end of the sequence by performing a nested PCR with the primer T7-Pt-g4238-Fw (5’-GTA ATA CGA CTC ACT ATA GGG CCA CAA AAG ATG GCC-3’) and T7-Pt-g4238-Rev (5’-GTA ATA CGA CTC ACT ATA GGG GAA CGG CTG AGT TTG-3’). This nested PCR yielded a 1046 bp fragment that was used for the initial knockdown of Pt-Ets4. Double stranded RNA (dsRNA) was produced using the MEGAscript T7 Kit (ThermoFisher SCIENTIFIC). Within one week, adult females of Parasteatoda tepidariorum were injected three to four times with 2 µl dsRNA solution (2–3 µg/µl). Water injections served as a control. The knockdown of Pt-Ets4 was performed several times (nexperiments > 5; ninjected females >24) and always resulted in the same phenotype. For the statistical analysis (Figure 2—figure supplement 1D–F) two non-overlapping fragments, targeting the CDS and the 3’UTR of Pt-Ets4, were used (see Figure 2—figure supplement 1C). The coding sequence of Pt-Ets4 was amplified using the primer Pt-CDS-Ets4-Fw (5’-GTA GTC TTG AAC TTC AGT TAT CAA AG-3’) and Pt-CDS-Ets4-Rev (5’-GGT TTA CTT CAA GAA CTG GAC-3’) and was cloned into the pCR4 vector (ThermoFisher SCIENTIFIC). The 3’UTR of Pt-Ets4 was amplified using the primer Pt-3’Ets4-Fw (5’-CAC TAT GGT TTC AAA CAT CGA TTG-3’) and Pt-3’Ets4-Rev (5’-GTC ATA TCC CCT CTA TAG CTA AC-3’) and was cloned into the pCRII-Blunt vector (ThermoFisher SCIENTIFIC). For the production of dsRNA the T7 promoter sequence was added to both ends of the CDS and the 3’UTR fragment by using the primer T7-Pt-CDS-Ets4-Fw (5’-GTA ATA CGA CTC ACT ATA GGG GTA GTC TTG AAC TTC AGT TAT C-3’) and T7-Pt-CDS-Ets4-Rev (5’-GTA ATA CGA CTC ACT ATA GGG GTC TGA AGT AAT CTT CTG ATA G-3’) and T7-Pt-3’Ets4-Fw (5’-GTA ATA CGA CTC ACT ATA GGG CAC TAT GGT TTC AAA CAT CG-3’) and T7-Pt-3’Ets4-Rev (5’-GTA ATA CGA CTC ACT ATA GGG CCT AAA ACA CAG TTT TAG GAG-3’), respectively. We observed a similar knockdown efficiency for both fragments with the highest penetrance in the third and fourth cocoons (Figure 2—figure supplement 1E and F). As many embryos were able to recover from the knockdown of Pt-Ets4 (one analyzed cocoon had a recovery rate of 71%; n = 66) during later stages of development (>stage 8, see Figure 2—figure supplement 1G), the number of affected embryos was analyzed during the embryonic stages 6 and 7. A gene fragment of Pt-decapentaplegic was amplified using the primers Pt-dpp-Fw (5’-GTG ATC ATA ACA GGT TCC TGA CC-3’) and Pt-dpp-Rev (5’-GAC AAA GAA TCT TAA CGG CAA CC-3’). The resulting 1147 bp Pt-dpp fragment was cloned into pCRII-Blunt vector. dsRNA template was generated by using T7 and T7Sp6 primer. We injected three adult females of P. tepidariorum with Pt-dpp dsRNA and the knockdown resulted in the same phenotype as published (Akiyama-Oda and Oda, 2006). We used the Pt-dpp pRNAi embryos of a fourth cocoon (the development of 73 embryos of this cocoon were monitored under oil; one embryo died and 72 embryos showed a strong BMP signaling defect phenotype (Akiyama-Oda and Oda, 2006) during stages 6–8) to perform the Pt-Ets4 in situ staining shown in Figure 4—figure supplement 1A. Two gene fragments of Pt-patched were amplified from a plasmid (containing a 2 kb fragment of Pt-ptc) using the primer T7-Pt-ptc-Fw1 (5’-GTA ATA CGA CTC ACT ATA GGG GGG TAG AAG ACG GCG G-3’) and T7-Pt-ptc-Rev1 (5’-GTA ATA CGA CTC ACT ATA GGG GAG ACT CTT TAG CTA TAA TCT C-3’) and T7-Pt-ptc-Fw2 (5’-GTA ATA CGA CTC ACT ATA GGG GAG ATT ATA GCT AAA GAG TCT C-3’) and T7-Pt-ptc-Rev2 (5’-GTA ATA CGA CTC ACT ATA GGG GAT TTG TTT GTC GAC CAC C-3’). dsRNA of both Pt-ptc fragments were combined and injected into three adult P. tepidariorum females. The knockdown resulted in the same phenotype as published (Akiyama-Oda and Oda, 2010) (see right column in Figure 2, Video 1). Amino acid sequences were obtained from FlyBase (RRID:SCR_006549) (dos Santos et al., 2015), WormBase (RRID:SCR_003098) (WormBase release Version: WS257), or translated from the P. tepidariorum AUGUSTUS predictions online (https://i5k.nal.usda.gov/Parasteatoda_tepidariorum). Amino acid sequences were aligned using MUSCLE (RRID:SCR_011812) (Edgar, 2004), alignments were trimmed using TrimAl with the GappyOut setting (Capella-Gutiérrez et al., 2009), and maximum likelihood based phylogenies were constructed using PhyML at ‘phylogeny.fr’ (Dereeper et al., 2008). Full amino acid sequences were used for all genes except for Pt-aug3.g5814.t1, which is missing the N-terminus but still contains the ETS domain (as predicted online [de Castro et al., 2006]). Final phylogenies were generated with the WAG substitution model and 1000 bootstrap replicates (Whelan and Goldman, 2001). Phylogenetic analysis was also performed using the ETS domains alone, and while tree topology changed in some ways, the Ets4 genes from D. melanogaster and C. elegans still branched together with strong support, and the gene we have named Pt-Ets4 was the only P. tepidariorum gene branching together with this clade. Experiments have been performed by injecting capped mRNA into late stage 1 embryos of P. tepidariorum. Embryonic microinjections were performed as described previously (Pechmann, 2016). For the production of capped mRNA, the mMASSAGE mMACHINE Kit (T7 or Sp6, ThermoFisher SCIENTIFIC) was used. Capped mRNA was injected at a concentration of 2–3 µg/µl. For the ectopic expression of Pt-Ets4 an EGFP-Pt-Ets4-PolyA fusion construct was synthesized at Eurofins Genomics (see Figure 5—figure supplement 1; see Supplementary file 1 for full sequence). For the production of capped mRNA, the construct contained a T7 and a Sp6 promoter at its 5’ end and could be linearized via NotI, PstI or EcoRI restriction enzyme digest. In addition, the coding sequence of EGFP-Pt-Ets4 was flanked by the 5’ and the 3’ UTR of the Xenopus beta-globin gene (also used in Tribolium [Benton et al., 2013]). For the ectopic expression of NLS-EGFP, the Pt-Ets4 sequence of the EGFP-Pt-Ets4-PolyA construct was removed (via BglII, SalI double digest) and replaced by the sequence MAKIPPKKKRKVED (contains the SV40 T antigen nuclear localization signal [Kanayama et al., 2010]). For this, the primer BglII-NLS-SalI-Fw (5’-TTT AGATCT ATG GCT AAA ATT CCT CCC AAA AAG AAA CGT AAA GTT GAA GAT TAA GTCGAC TTT-3’) and BglII-NLS-SalI-Rev (5’-AAA GTCGAC TTA ATC TTC AAC TTT ACG TTT CTT TTT GGG AGG AAT TTT AGC CAT AGATCT AAA-3’) (coding for the NLS sequence) were annealed to each other, digested with BglII and SalI and inserted to the already cut vector. This resulted in an EGFP-NLS-PolyA construct (see Figure 5—figure supplement 1). The function of Pt-Ets4 was analyzed either by injecting capped mRNA of the Pt-Ets4-EGFP fusion construct alone or by injecting capped mRNA of Pt-Ets4 (the EGFP was removed from the EGFP-Pt-Ets4-PolyA construct via an XhoI digest) together with capped mRNA of EGFP-NLS. Ectopic expression of Pt-Ets4 co-injected with EGFP-NLS resulted in the same phenotype as shown for the EGFP-Pt-Ets4 fusion construct. To obtain a stronger signal during live imaging, capped mRNA of EGFP-Pt-Ets4 was co-injected with EGFP-NLS. To mark the membranes of the embryonic cells and to visualize the delamination process of the Pt-Ets4 positive cell clones, capped mRNA coding for lynGFP (Köster and Fraser, 2001) was co-injected with capped mRNA coding for EGFP-Pt-Ets4. Next to the ectopic expression of lynGFP we tried to ectopically express GAP43YFP (another marker that was shown to localize to the cell membranes of Tribolium embryos [Benton et al., 2013, Benton et al., 2016]). However, we observed a much stronger signal for lynGFP. Embryos used for RNA in situ hybridization were fixed in a two phase fixative containing 1.5 ml of PBS, 1.5 ml 10% formaldehyde and 3 ml heptane. Prior to fixation embryos were dechorionated for 3–5 min in a 2.8% hypochlorite solution (DanKlorix). The embryos were washed with H2O several times and were transferred to the fixative, subsequently. Embryos were fixed for over night at room temperature and 50–100 rpm. After the fixation embryos were gradually transferred (30%, 50%, 80%) to 100% methanol. In situ hybridization was performed as previously described (Prpic et al., 2008) with minor modifications (proteinase K treatment was not carried out). Fluorescent FastRed staining was performed as described in (Benton et al., 2016). RNAi embryos were fixed at the desired stage. The development of several embryos of the same cocoon was monitored under oil. Only the embryos of severely affected cocoons were used for this analysis. For each round of in situ hybridization (as a control) the embryos from the same cocoons were analyzed for the expression of Pt-Ets4. For the control and for the Pt-Ets4 knockdown, more than 10 embryos were analyzed for the expression of each gene. Control and Pt-Ets4 knockdown embryos were fixed according to the same fixation protocol (see above). Expression analysis of Pt-Ets4, Pt-hb, Pt-fkh, Pt-dpp and Pt-fascin in control and Pt-Ets4 RNAi embryos (Figure 2—figure supplement 1A and B; Figure 4) was performed at the same time and stage (using the same solutions, probe concentrations and probes from the same probe synthesis reaction) and the color reaction was stopped at identical time points. As Pt-fascin is weakly activated by Pt-Ets4, the color reaction of the Pt-fascin staining in mid stage 5 embryos (Figure 3D) took much longer. After the injection of capped mRNA coding for EGFP-Pt-Ets4, pictures of the single living embryos that exhibited an EGFP-Pt-Ets4 positive cell clone were taken. The same embryos were fixed by injecting 10% formaldehyde to the perivitelline space and were incubated for several hours at room temperature. To remove the oil, the single embryos were transferred to heptane and the chorion was removed using forceps. Subsequently, the single embryos were transferred to 100% methanol and the vitelline membrane was removed using forceps. In situ hybridization on the single embryos was performed as described above. The expression analysis of each gene was performed in three control (injection of capped mRNA coding for EGFP) and three EGFP-Pt-Ets4 overexpression embryos. To analyze BMP pathway activity in control and Pt-Ets4 knockdown embryos a pMAD antibody staining was performed in embryos that were already stained for Pt-otd (via in situ hybridization, n > 10 for control and Pt-Ets4 RNAi embryos). Embryos were fixed as described above. We used an anti green fluorescent protein mouse IgG antibody (A11120; ThermoFischer SCIENTIFIC (RRID:AB_221568); final concentration 1:1000) as primary and an Alexa Fluor 488 goat anti mouse IgG (A11001; ThermoFischer SCIENTIFIC (RRID:AB_2534069); final concentration 1:400) as secondary antibody. To stain all of the embryonic cells, in situ hybridization with the ubiquitously expressed gene Pt-arm was carried out in early stage 5 embryos of control and Pt-Ets4 RNAi embryos. Embryos were then stained with Sytox Green (1:5000 in PBST, ThermoFischer SCIENTIFIC). Embryos were then gradually (50%, 70%, 90%) transferred to 100% EtOH. After a washing step in 1:1 EtOH/acetone, the embryos were transferred to 100% acetone. Single embryos were transferred to microtome embedding molds in a 1:1 durcupan/acetone solution. Acetone was removed by incubating the embryos at room temperature (o.n.). The embedding molds were filled with fresh durcupan (Fluka). Polymerisation of the durcupan was carried out at 65°C (16–20 hr). Cross sectioning (8 µm) was performed on a LEICA RM 2255 microtome (n = 3 for control and Pt-Ets4 RNAi embryos). RNA from stage 1–3 embryos was extracted and sequenced as described in the ‘Identification of Pt-Ets4’ section above. These sequences were made available for us to download from the Cologne Centre for Genomics server, and FastQC (RRID:SCR_014583) (Andrews, 2010) was used for initial assessment of read quality. This was excellent (lower quartile Phred quality above 30 until the last base in the read, no residual adapter sequence noted) and as such no trimming was performed. Comparative expression analysis was performed by mapping reads to Parasteatoda_tepidariorum AUGUSTUS gene predictions (https://i5k.nal.usda.gov/Parasteatoda_tepidariorum) using RSEM 1.2.28 (Li and Dewey, 2011) and Bowtie 1.0.0 (RRID:SCR_005476) (Langmead, 2010) as packaged in the Trinity 2.2.0 module (RRID:SCR_013048) (-est_method RSEM—aln_method bowtie [Grabherr et al., 2011]). Cross sample normalization was performed using Trimmed Mean of M-values, and edgeR (RRID:SCR_012802) (Robinson et al., 2010) was run to determine differential expression with a dispersion ratio fixed at 0.1. Those differentially expressed genes with a p-value cut off for FDR of 0.001 and min abs(log2(a/b)) change of 2 were then chosen for annotation and further examination, with target gene results provided in Figure 1—figure supplement 1. Pictures were taken using an Axio Zoom.V16 that was equipped with an AxioCam 506 color camera. Confocal imaging was performed on a LSM 700 (Zeiss). Live imaging was carried out on the Axio Zoom.V16, a Zeiss AxioImager.Z2 (equipped with an AxioCam MRm camera and a movable stage) and on a Leica CLSM SP8 (Imaging facility Biocenter Cologne). Projections of image stacks were carried out using Helicon Focus (HeliconSoft (RRID:SCR_014462)) or Fiji (Schindelin et al., 2012) (RRID:SCR_002285). All movies have been recorded at room temperature and images have been adjusted for brightness and contrast using Adobe Photoshop CS5 (RRID:SCR_014199). For false-color overlays of in situ hybridization images a bright field image of the NBT/BCIP staining was inverted. This inverted picture was pasted into the red channel of the nuclear stain image. The input levels (Adobe Photoshop CS5; Levels function) of the red channel were adjusted in a way that only the signal of the NBT/BCIP staining remained visible. Development, Growth & Differentiation 58:215–224. In: P. M Wassarman, editors. Current Topics in Developmental Biology. Academic Press. pp. 435–454. Development Genes and Evolution 225:207–219. Annual Review of Biochemistry 80:437–471. A. Dros. Res. Conf 44:554B. Arthropod Structure & Development 39:436–445. Development Genes and Evolution 216:821–828. Aligning short sequencing reads with Bowtie, Curr Protoc Bioinformatics, Unit 11.7, 10.1002/0471250953.bi1107s32. Development Genes and Evolution 222:189–216. Journal of Thermal Biology 60:125–131. Development, Growth & Differentiation 50:203–214. Cold Spring Harbor Protocols 2008:pdb.prot5068. A Wanninger, editors. Springer Vienna. The International Journal of Biochemistry & Cell Biology 29:1371–1387. The International Journal of Developmental Biology 45:13–38. Thank you for submitting your article "A novel role for Ets4 in axis specification and cell migration in the spider Parasteatoda tepidariorum" for consideration by eLife. Your article has been reviewed by two peer reviewers, and the evaluation has been overseen by a Reviewing Editor and Diethard Tautz as the Senior Editor. The following individual involved in review of your submission has agreed to reveal his identity: Prashant P Sharma (Reviewer #3). Summary: This work provides important insights into the maintenance of the cumulus in the spider, Parasteatoda tepidariorum. The cumulus serves as an early organizer in spider embryos, and this manuscript provides important insights into the control of cumulus migration by Ets4. The work also provides an excellent example of using various recent technologies to make rapid progress in new model systems. It also provides very important insights into the molecular control of an organizer and will allow for comparisons of organizer function between phylogenetically distant species. 1) The authors should describe the treatment of the control and RNAi embryos in more detail, i.e. did the authors do the fixation and in situ hybridisation of the control and RNAi embryos in parallel using the same solutions? Was the duration of the staining the same for control and RNAi embryos? 2) The authors should submit stage-specific transcriptomes to NCBI and including sample sizes for all experiments. These are important details and we have added the missing information to the manuscript. As the injected spider females do not produce the cocoons at the same time, it is impossible to fix all of the analysed embryos in parallel. However, all embryos were fixed according to a well-established fixation protocol. We have added a detailed description of this fixation protocol to the Materials and methods section “Whole mount in situ hybridisation”. Whenever we compared the expression of a given gene, we have performed RNA in situ hybridizations in parallel using the same solutions, probe concentrations and probes from the same probe synthesis reaction. For these experiments, the duration of the staining was also the same for control and RNAi embryos. Expression analysis of Pt-Ets4, Pt-hb, Pt-fkh, Pt-dpp and Pt-fascin (Figure 2—figure supplement 1A and B; Figure 4) as well as the pMad antibody staining (Figure 3E-F) in control and Pt-Ets4 RNAi embryos has been performed at the same time and the color reaction was stopped at identical time points. We have added this information to the Materials and methods sections “In situ hybridization on Pt-Ets4 RNAi embryos” and “pMad antibody staining”. As Pt-fascin is weakly activated by Pt-Ets4, the color reaction of the Pt-fascin staining in mid stage 5 embryos (Figure 3D) took much longer. We have added this information, too. The stage-specific transcriptomes have been publicly released and are available under the BioProject ID: PRJNA383558. This information is also provided in the Materials and methods section “Identification and cloning of Pt-Ets4 sequence”. Where missing, we have added sample sizes for the experiments to the respective Materials and methods section. We thank Evelyn Schwager for details on the durcupan-sectioning protocol and Mette Handberg-Thorsager for providing the lynEGFP construct. We thank Hiroki Oda and Maarten Hilbrant for comments on the manuscript. © 2017, Pechmann et al.